As a registered client of ASPSMS youget the latest information about our newly available SMS applications. - SMSBLASTER.COM web edition: Unlock a mobile number? How it works! - List your ASPSMS application at our 3rd-party solutions! Log-in with your user e-mail and password. Enter the number you want to unlock. SMSBLASTER.COM web edition sends the unlock code by SMS to the number entered. Enter the unlock code you have received by SMS to the website and click the button Unlock. All authorized numbers are listed on the website. If needed you can unlock further numbers in the same manner or delete unused ones. Note: Originators of devices that are not capable of receiving SMS (e.g. fixnet numbers) can not be unlocked automatically with this procedure. If you would like to use such a number, please contact our support. At the section Originator you will find the newly unlocked number in the pull-down menu. If you want to send a short message with an unlocked number as originator, choose it from the pull-down menu. Alternatively you can stil use alphanumeric originators in the text box to the right. Important note: always check your originator before sending an sms. 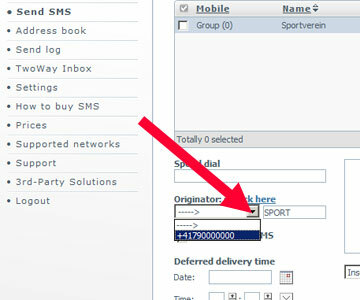 Basically you can set an alphanumeric or a numeric originator when sending SMS. It is not possible to reply to alphanumeric originators, but to numeric originators it is! We are looking forward to present our successful online advertising formats and products like e.g. PosterAd, AdSpot, SMSBLASTER.CH web edition, Pools (Youth-Pool, Snow-Pool, Scene-Pool, Weather-Pool) to you. 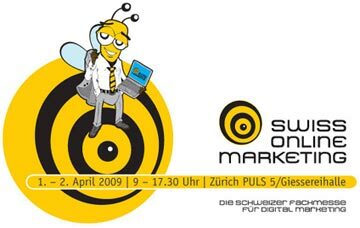 Visit us at the Swiss Online Marketing 2009 in the Giessereihalle PULS5 at the booth K.02. We will send you the tickets by mail. Please be aware, that your ticket order must reach us until Wednesday, March 25th. Then you will get the tickets soon enough. We are looking forward to interesting personal discussions. We would like to welcome you in our agency location starting April. Send SMS with a Global Two-Way number als originator. List your ASPSMS application at our 3rd-party solutions! Send us a link or a demo version of your softwarewith the appropriate login data to support@aspsms.com so we cantest your product. We shall examine your software and let you know if we shall publish it at ASPSMS 3rd-party solutions.Please understand that we can only take well-engineered and error free products into consideration. If you have a german documentation, don't hesitate to send it for our german website. With this feature you can let yourself be informedby SMS and/or e-mail if your credit balance reaches orgoes below a certain level.